Yep. You read that right. Everyone is doing things with bacon these days, so why not make yet another. Good for you? Well it’s wrapped in bacon so yes it will be great for you. It’s actually fairly simple to make…nothing fancy! the best part is you don’t even need a side dish as it’s stuffed with mac ‘n’ cheese so just call it an all in one meal! Use your favorite meatloaf recipe. Same goes for your mac n’ cheese. Now just combine the 2! Cook the noodles according to package directions. Drain. Stir in the cheese, milk and butter. Keep on low and stir occasionally until cheese is completely melted. If it seems to thick add a bit more milk. Remove from heat and set aside. Mix all ingredients together in a large bowl. Set aside. 2. Line a loaf pan with foil. Place half of the meat mixture in the pan and press down and up the sides creating a well in the middle. 3. Add your mac ‘n cheese to well. (you may not use all of it, if not, snack on it while the meatloaf is in the oven). 4. Place the rest of the meat mixture on top, sealing the sides. 5. Line a sheet pan with foil. Place the sheet pan on top of the loaf pan, flip over, transferring the meatloaf to the sheet pan. 6. Discard foil from loaf pan. Perfect the form of your loaf and make sure the sides are sealed well so no noodles escape! 7. Place the bacon on top and tuck the ends under the loaf. I did a basket weave. Bake in the oven for 30 minutes. If you have a sauce or glaze you like for your meatloaf, feel free to add it to the top now and turn oven to *375 and bake for 15-20 more minutes, or until sauce is bubbly and meatloaf is cooked through. Remove from oven and let rest 10 minutes before slicing. 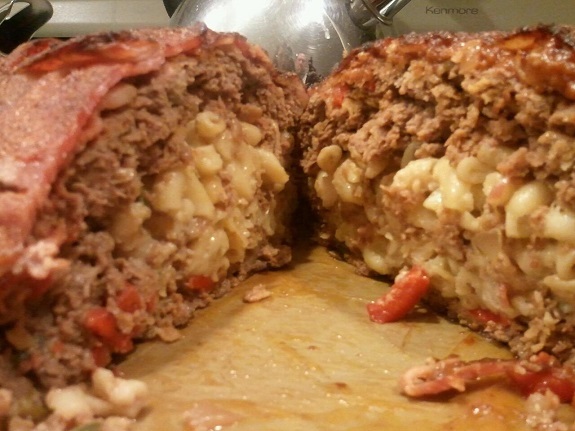 Have you ever stuffed a meatloaf or fatty with something more unusual than Mac & Cheese? What’s the craziest thing you’ve ever stuffed a meatloaf or fatty with? Let us know in the comments below!